You'll be £14.99 closer to your next £10.00 credit when you purchase Tabletop Wargames: A Designers’ and Writers’ Handbook. What's this? Unlike chess or backgammon, tabletop wargames have no single, accepted set of rules. Most wargamers at some point have had a go at writing their own rules and virtually all have modified commercially available sets to better suit their idea of the ideal game or to adapt favourite rules to a different historical period or setting. But many who try soon find that writing a coherent set of rules is harder than they thought, while tweaking one part of an existing set can often have unforeseen consequences for the game as a whole. Now, at last, help is at hand. Veteran gamer and rules writer John Lambshead has teamed up with the legendary Rick Priestley, creator of Games Workshop’s phenomenally successful Warhammer system, to create this essential guide for any would-be wargame designer or tinkerer. Rick and John give excellent advice on deciding what you want from a wargame and balancing ‘realism’ (be it in a historical or a fantasy/sci-fi context) with playability. They discuss the relative merits of various mechanisms (cards, dice, tables) then discuss how to select and combine these to handle the various essential game elements of turn sequences, combat resolution, morale etc to create a rewarding and playable game that suits your tastes and requirements. This paperback is profusely illustrated with colour photographs of wargames in progress and offers an extensive list of reference works. This handy book should enable wargamers to create their own richly rewarding experiences. As featured on Wargaming Hub. As featured on Pocket Mags. The book is arranged into themed chapters that can be read sequentially or dipped into individually. Scale, randomness and even the language of rules-writing are covered in an approachable and readable style. As featured on Firetrench news. Unlike chess or backgammon, tabletop wargames have no single, accepted set of rules. Most wargamers at some point have had a go at writing their own rules and virtually all have modified commercially available sets to better suit their idea of the ideal game or to adapt favorite rules to a different historical period or setting. But many who try soon find that writing a coherent set of rules is harder than they thought, while tweaking one part of an existing set can often have unforeseen consequences for the game as a whole. Now, at last, help is at hand. There is much to like about Tabletop Wargames. Rick Priestley’s rules in particular are such models of elegant design that it is almost redundant to point out the crispness of his book on how to write them. Nowhere is that more evident than in the technical chapters on scale and dice-rolling where potentially tedious material is turned into deftly handled exposition. In addition, at no time do the authors abandon their own rules on writing with clarity and brevity, although sometimes their points are too brief. Tabletop Wargames most importantly achieves its objectives. The authors describe it as a handbook for designing rules, and by following their guidelines prospective rules writers will, I suspect, not go too far wrong. A book that does what the title says. Well written by 2 knowledgable and experienced authors, this is both informative and accessible. Wargamers who intend to write rules will find this solidly useful, and those that don't will understand the rules they are buying and using much better. Highly recommended to anyone who wishes to understand our hobby more thoroughly. Two veteran writers give the benefit of their experiences in producing wargaming rules over 25 years or more. As to be expected, the book is full of wisdom about the structural elements of games and the compromises that have to be made. It's a good read - virtually a well-written philosophical tract, highly readable, clearly organised and altogether high production values. I enjoyed it and it certainly helped me see a 'bigger picture'. The book is well written and lays down a lot of different aspects of rules writing that need to be considered. The book is full of photographs and is very well written as you'd expect from a book that talks about how to write rules. It's also full of useful information for those contemplating designing a tabletop wargame. Tabletop Wargames has provided an enjoyable new angle on my hobby and a refreshing stimulus to my imagination. the game of history with figurines, do not hesitate to discover this "atypical" but exciting work. Tabletop Wargames lays out issues that designers must resolve, and offer examples of different mechanisms. The book begins with a discussion on the line between a simulation and a game, then covers gaming scales, probabilities, turn sequences, combat resolution, presentation, how skirmish games differ from larger scale games, point values, campaigns and scenarios. There is even a section with advice on how to keep the gaming language neat and tidy so that the rules lawyers do not have a field day. The tone of Tabletop Wargames is conversational, and the book is laden with exemplars from rules sets that most gamers will recognize. It is a quick read, but has enough material to make it worth going back to for reconsideration when making critical decisions about your rules set. Wargaming has long been a popular pastime, one which still attracts a lot of modellers rather than just being distracted by computer based games. This is a new book written by two experienced authors of gaming rules. An interesting comparison is that of tabletop wargaming with Chess. 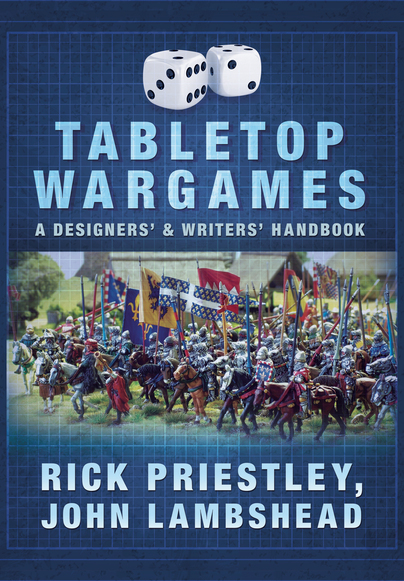 This informative new book is aimed directly at war gamers who wish to write their own rules for their table top games, whatever the size of the figures being used, or period in which the game is set. War gamers generally agree that there is no such beast as a perfect set of rules; published – often expensive - rules are frequently ‘locally’ amended, revised and quite happily adapted as required. The pitfall however is that tinkering with one aspect of the published rules has a ‘knock on’ habit of affecting other sections, often seemingly unrelated to the section that has been changed. Help is at hand however and the two authors, both of whom enjoy a long standing pedigree of writing rules for war games, have created this most useful guide to assist those war gamers who would like to write their own rules for their battles in miniature. The authors present their experience in this field and make their knowledge readily available. Aspects such as the language of design, presenting game rules, ‘English as she is writ’ and expanding the rule book are included to assist the would-be writer. The authors offer advice on balancing ‘realism’ with playability, the relative merits of the various mechanisms available (cards dice etc. ), as well as how to manage game turn sequences, resolving combat and the sometimes tricky question of morale. An interesting and useful book, which will undoubtedly be frequently taken down off the war gamers’ shelf for reference. Dr John Lambshead designed the award-winning computer game, Frederick Forsythe’s Fourth Protocol, which was the first icon driven game, was editor of Games & Puzzles and Wargames News, and has written a number of wargaming for Games Workshop. He is now a novelist writing SF&F and is published by Bane Books. He is now working on the officially licensed Dr Who gaming rules.